Teaching mathematics is an extremely rewarding endeavor. Math educators savor the moments when they see the understanding of a concept they have worked hard to develop dawn on a student or group of students. It is exciting to share your enthusiasm for the structure of mathematics with others, and as a result, sparking an interest that may lead students to become the next generation of scientists, engineers, doctors, etc. The need for exceptional math teachers is high, and Malone is committed to preparing you to be ready to enter the workforce after graduation. Through vigorous classroom study and many opportunities to learn in the field, you will have the experiences necessary to become a confident, dedicated educator. You will major in mathematics and also take education courses towards earning secondary teaching licensure for grades 7–12. According to studies, not only do mathematics majors score the highest of students in any field on the LSAT and GMAT (tests required for law and business school entrance), but they also make higher salaries and report higher levels of job satisfaction than almost any industry. You’ll develop highly marketable skills sought after by nearly every sector of the job market, from engineering to science and technology, from telecommunications to pharmaceuticals, from government work to teaching in the classroom. If you have a head for numbers and want to continue developing your analytical skills and problem-solving abilities, you’ll have the opportunity for one-on-one research with professors in coding theory, encryption, and graph theory. You'll collaborate with students in other departments, such as music. You could tutor other students, experiencing how to communicate mathematics to others who need your help. 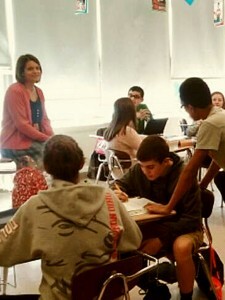 Laura has been teaching mathematics for 23 years at Claymont Middle School in Tuscarawas County. She and her husband have three adult children.